On Tuesday, November 20, 2018, Vince, age 90, formerly of Oakwood. Beloved husband for 40 years of Helen DeNardis. Loving father of Darlene (Bill) Flaherty, David (Judy) DeNardis, Denise (Park) Warne and Diane (Bob) Eberle and step-father of Connie (Dave) Van Asdale, Gale (Dave) Wassum, Gary (Cindy) Marshall, Tom (Carol) Marshall, Jan (Mike) Tenney, Bill (Diane) Marshall and Chris Marshall; numerous grandchildren and great-grandchildren; brother of Eda Simonsen, Clara DeNardis, Josephine (Angelo) Amoroso and the late Albert DeNardis. Vince grew up in the Oakwood section of Pittsburgh, where he played on the local baseball and football teams. 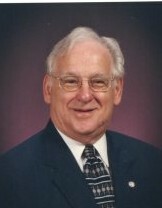 He was a 1945 graduate of Langley High School. He served as a Corporal in the U.S. Army during the Korean War, where he was a Chaplain's Assistant in the combat zone. Vince returned to Oakwood to raise his family. He went to work for National Valve in Pittsburgh and attended night school at Carnegie Tech for ten years to obtain his BS in Mechanical Engineering in 1966. He retired from National Valve after forty years of service. Vince was an accomplished musician and a life long bowler, and he always had a very wide circle of good friends. He will be greatly missed by his wife, children, grandchildren and great-grandchildren. Friends received at the Hershberger-Stover Inc. Funeral Home, 170 Noble Avenue, Crafton, on Monday, 2-4 and 6-8 p. m. where funeral service will be on Tuesday at 11 a.m. Interment with military honors will be in the National Cemetery of the Alleghenies. If desired, memorials may be made to the Alzheimer's Association, 1100 Liberty Ave., Suite E 201, Pgh., PA 15222.